Manila, Philippines - Weather bureau PAGASA releases advisory for Low Pressure Area prevailing over Mindanao and Visayas regions. 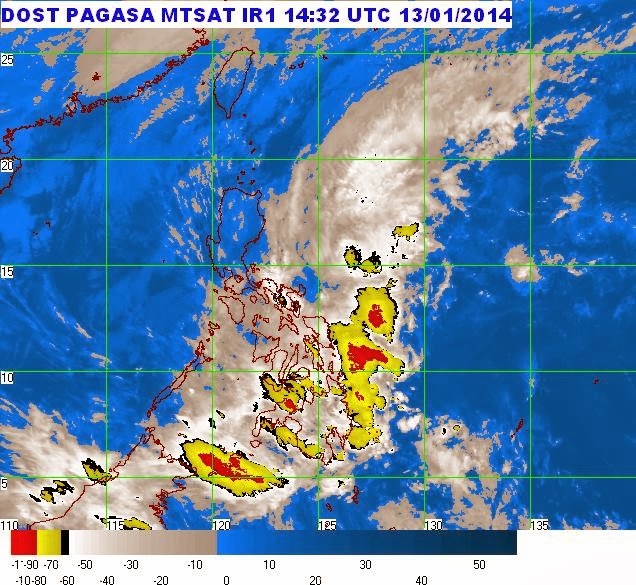 In the latest bulletin issued at 10:30 PM on Monday, January 13, 2014, LPA was estimated at 60 km Northeast of Cagayan de Oro City (9.0˚N, 124.8˚E). PAGASA said that this weather system will bring cloudy skies with moderate to occasionally heavy rains and thunderstorms over Visayas and the regions of Bicol, CARAGA and Northern Mindanao which may trigger flashfloods and landslides. The rest of southern Luzon and of Mindanao will be cloudy with light to moderate rains and thunderstorms. Residents are advised to take all the necessary precautionary measures. Strong to gale force northeasterly surface wind flow associated with the surge of the northeast monsoon is expected to affect northern, eastern and southern seaboards of Luzon and the eastern seaboard of Visayas. Hence, small seacrafts and fishing vessels are advised not to venture out into the sea due to big waves generated by this weather system. Due to floods and landslides brought about by the Low Pressure Area (LPA) affecting some areas in Mindanao today, cancellation of classes has been declared for January 13 by the local government units (LGUs) in Compostela Valley, Bayabas, Surigao del Sur, Dinagat Islands, Davao del Norte, Butuan City , Agusan del Norte, Surigao del Norte and .Surigao del Sur.